Being an independent photographer or “freelancer” as my job is more commonly referred to, has many challenges. I never quite know the what, where or when of my next assignment (or when the next check will arrive in my mailbox!) I am my own marketing, advertising, social media, accounting, IT and creative services departments, all rolled into one. The upside is that I have the flexibility to manage my own time, which I do by balancing my work load with jobs that are necessary to pay the bills, and those that are interesting, creative and fun (sometimes they are one and the same, but not often enough!) 2013 has already been filled with a mix of interesting and varied assignments, looking forward to what the rest of the year will bring. 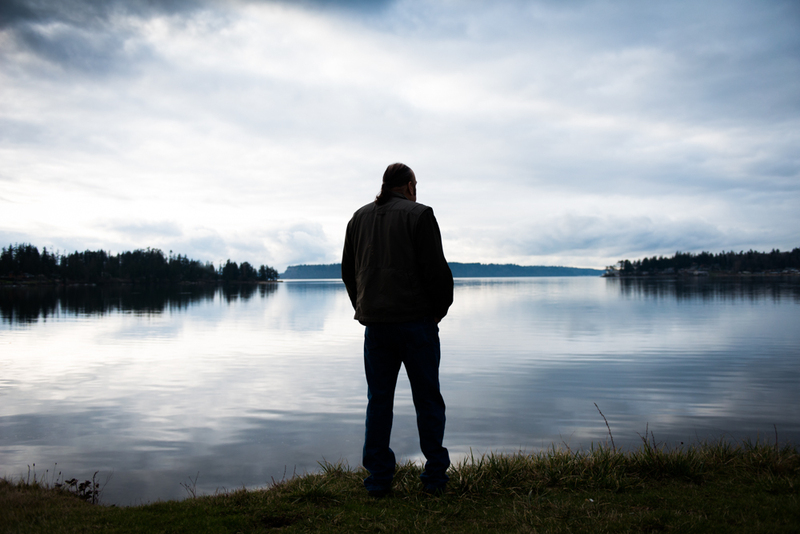 Terry Williams, commissioner of fisheries and natural resources for the Tulalip Tribes, looks out across Tulalip Bay near Marysville, WA. I was hired by the Ocean Conservancy to shoot a number of subjects for a project they are doing on ocean acidification. We traveled to sites in Washington that included Neah Bay, Olympia, Marysville, Shelton and our home-base of Seattle during a three-day period. Two of my favorite images from that assignment are of Terry Williams, a tribal leader with the Tulalip Tribe. 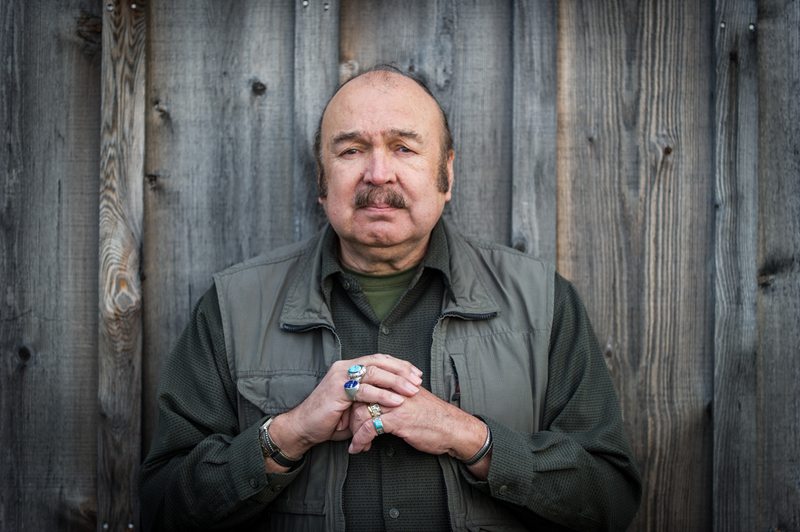 Terry Williams, Tulalip Tribe, poses for a portrait. Back home in Seattle, I spent a couple of days shooting stills for Megan Griffiths’ new film “Lucky Them” starring Toni Collette and Thomas Haden Church. I shot stills for Megan’s last film “Eden,” which debuted at the SXSW Film Festival in Austin, TX, will be showing at the New York Film Forum in March and has won a number of awards. The days on set are long, with many exterior shots (meaning standing out in the cold and rain) but lots of fun. I love watching the process of making a film and Megan always assembles a top notch crew of talented people. The challenge is to shoot stills that look like the scenes in the film, without getting in the way of the cinematographers and everybody else on set, and doing it all with a sound blimp around my DSLR so my camera doesn’t make any clicking noises. 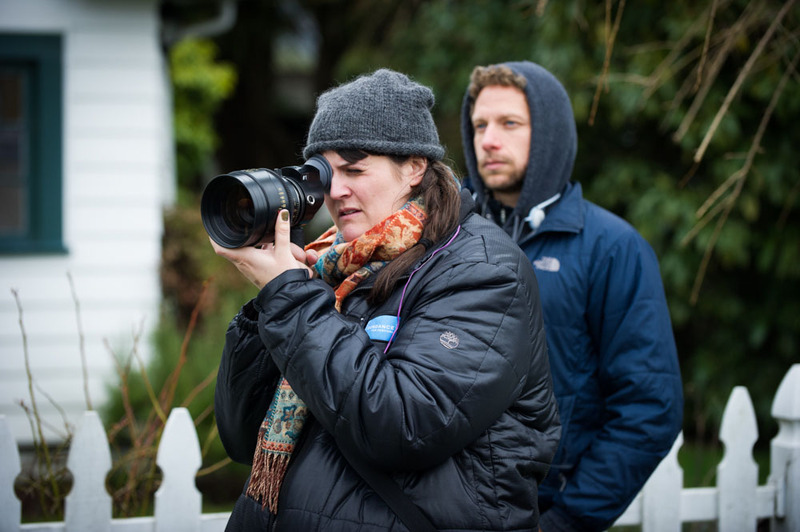 Director Megan Griffiths on the set of “Lucky Them” with director of photography Ben Kuchins. I continue to do work for the Washington Athletic Club monthly magazine. I photographed three people for a story on members who work at non-profits. My shot of Jamie Van Horne, director of partnerships at SeeYourImpact.org, made the cover. She works in a great building in Pioneer Square with big windows and high ceilings in the common room. I was able to just bounce a strobe off the side wall that mixed nicely with the ambient light for this cover shot. 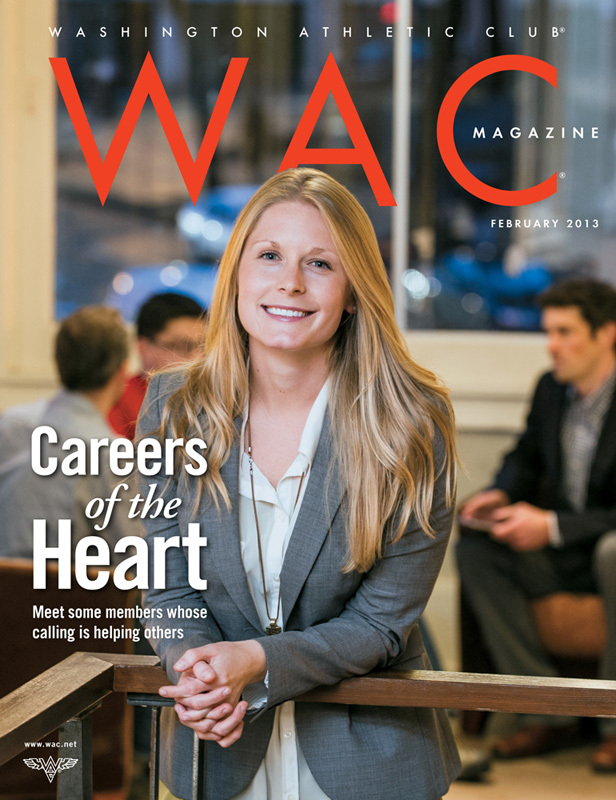 Jamie Van Horne, director of partnerships at SeeYourImpact.org, on the cover the Washington Athletic Club magazine. I was hired to do a shoot for Health.com for a feature they call “I Did It!” which highlights the story of someone who has lost a lot of weight through diet and exercise. They wanted the shot outside, with our subject, Megen Karlinsey, in workout clothes. Those of us living in Seattle know that January is NOT the time to be doing a shoot outdoors, because chances are it is going to rain. It wasn’t just raining the day of our shoot, it was pouring, heavily. I had done some brainstorming the day before and bought a clear umbrella for Megen to hold. We did the shoot just down from my house on a bridge that I drive over everyday. The bridge has a great view of Seattle’s downtown and an awesome green railing that curves to make a nice graphic photo. I don’t think the photo has run on the site yet, so here is a photo of my friend and wonderful hair, make-up artist and stylist, Glynne Davies, braving the elements for the photograph. Megen Karlinsey with hair and make-up artist Glynne Davies on the Jose Rizal bridge in Seattle. Finally, I spent four days in Palm Springs (I know, I know….tough job) in January for the Clinton Foundation Health Matters conference and Humana Golf Challenge. 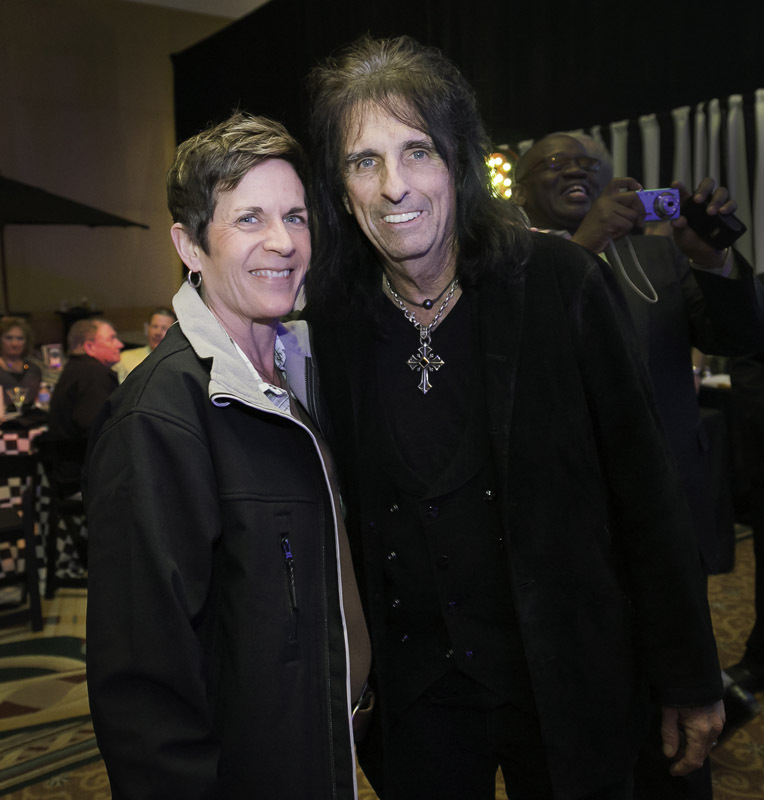 Rather than posting yet another photo of President Clinton or a photo of a professional golfer who I wouldn’t even be able to identify, I end with a picture of me (either sunburned or blushing) and Vincent Damon Furnier, better know as rocker Alice Cooper, who attended and performed at one of the awards dinners. Schools Out Forever! glynne on February 22, 2013 at 8:25 am. Hank on February 22, 2013 at 8:55 am. OK, Hank just fell off his chair. Great photos, per usual: You rock. And then Alice Cooper. PaTHWACK! Hank’s not worthy! Good thing it was you there.